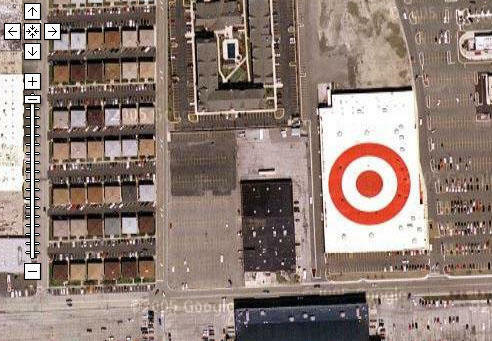 Advertisers are slowly discovering the potential of Google Maps, and some, like the Target store above (more at Google Sightseeing), are even enjoying some unexpected windfall. Poynter Online talks about realtors tapping into satellite imaging tools. Google Maps Mania is running a log on map hacks, some of them by businesses. Scavengeroogle is an armchair scavenger hunt based on the service - you too can have people looking for your brand landmark (like, again, the Target stores). Here's a how-to on integrating Google Maps into your website .